The never-before-told true account of the design and development of the first desktop computer by the world's most famous high-styled typewriter company, more than a decade before the arrival of the Osborne 1, the Apple 1, the first Intel microprocessor, and IBM's PC5150. The human, business, design, engineering, cold war, and tech story of how the Olivetti company came to be, how it survived two world wars and brought a ravaged Italy back to life, how after it mastered the typewriter business with the famous "Olivetti touch," it entered the new, fierce electronics race; how its first desktop compter, the P101, came to be; how, within eighteen months, it had caught up with, and surpassed, IBM, the American giant that by then had become an arm of the American government, developing advanced weapon systems; Olivetti putting its own mainframe computer on the market with its desktop prototype, selling 40,000 units, including to NASA for its lunar landings. 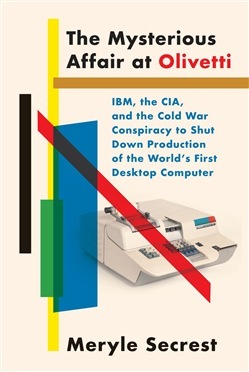 How Olivetti made inroads into the US market by taking control of Underwood of Hartford CT as an assembly plant for Olivetti's own typewriters and future miniaturized personal computers; how a week after Olivetti purchased Underwood, the US government filed an antitrust suit to try to stop it; how Adriano Olivetti, the legendary idealist, socialist, visionary, heir to the company founded by his father, built the company into a fantastical dynasty--factories, offices, satellite buildings spread over more than fifty acres--while on a train headed for Switzerland in 1960 for supposed meetings and then to Hartford, never arrived, dying suddenly of a heart attack at fifty-eight . . . how eighteen months later, his brilliant young engineer, who had assembled Olivetti's superb team of electronic engineers, was killed, as well, in a suspicious car crash, and how the Olivetti company and the P101 came to its insidious and shocking end. Acquista The Mysterious Affair at Olivetti in Epub: dopo aver letto l’ebook The Mysterious Affair at Olivetti di Meryle Secrest ti invitiamo a lasciarci una Recensione qui sotto: sarà utile agli utenti che non abbiano ancora letto questo libro e che vogliano avere delle opinioni altrui. L’opinione su di un libro è molto soggettiva e per questo leggere eventuali recensioni negative non ci dovrà frenare dall’acquisto, anzi dovrà spingerci ad acquistare il libro in fretta per poter dire la nostra ed eventualmente smentire quanto commentato da altri, contribuendo ad arricchire più possibile i commenti e dare sempre più spunti di confronto al pubblico online.